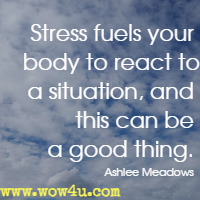 Having appropriate amounts of stress can actually be a good source of motivation as it can drive you to strive harder to achieve your goals. 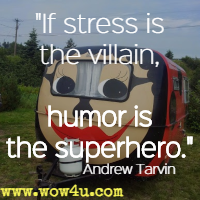 Negative stress however can diminish your quality of life affecting you both mentally and physically. Luis M. Rodriguez, Stressed Out? "Stress is simply the adaptation of our bodies and minds to change; and change, as we noted, is about the only constant left in the workplace." Peter G. Hanson, M.D. When we are stressed, we tend to take more shallow breaths. But our bodies need oxygen! Iovana Yao, Parenting: Forgive Me For Yelling At You! Challenge opens doors that stress closes. 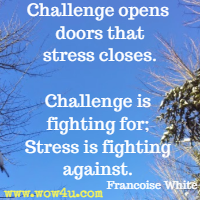 Challenge is fighting for; Stress is fighting against. Francoise White, The Little Toolbox for Anxiety, Anger, Depression and Guilt.